In partnership with People & Planet, NUS has developed the Fossil Fuel Declaration. By signing this, universities are affirming their current fossil free status, as well as their commitment to remaining so in the future. Has your university signed it yet? Congratulations to those that have! The Fossil Fuel Declaration is part of Ask 2 of our campaign. It has been co-created with People & Planet and is for those institutions who already do not have fossil fuel investments. By affirming their current fossil free status, as well as commiting to remaining so in the future, these institutions join the global fossil fuel divestment movement. So far, thirteen universities have signed. Is your University one of them? 1. Get in touch with your Finance Director and/or Vice-Chancellor to ask them to sign the declaration. 2. 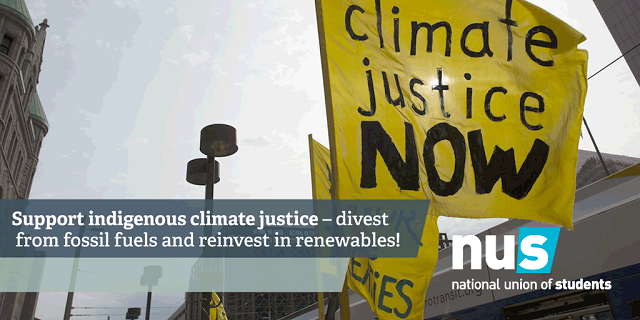 Set up a Fossil Free petition and start building support across your institution. Universities exist for the public good, from conducting life-changing research to educating the global citizens and leaders of tomorrow, and they are at the forefront of climate change research. As such we think it’s important to not invest in an industry that has 5 times more reserves than it is safe to burn to stay within the parameters of 1.5 and 2 degrees of global warming. We have students studying with us from across the world, many of whom come from communities in the Global South who are already feeling the effects of and are on the frontlines of climate change. We want to protect the future of all of our students – current and future. Anglia Ruskin University signed by Professor Iain Martin, Vice-Chancellor. Buckinghamshire New University signed by Professor Rebecca Bunting, Chief Executive and Vice-Chancellor. Canterbury Christ Church University signed by Professor Rama Thirunamachandran, Vice-Chancellor and Principal. Newman University signed by Professor J Scott Davidson, Vice-Chancellor. Nottingham Trent University signed by Professor Edward Peck, Vice-Chancellor. University of Bedfordshire signed by Bill Rammell, Vice-Chancellor. University of Chester signed by Adrian Lee, University Secretary. University of the Creative Arts signed by Alan Cooke, Deputy Vice-Chancellor. University of Cumbria signed by David Chesser, Chief Operating Officer. University of Winchester signed by Professor Joy Carter DL, Vice-Chancellor. Wrexham Glyndŵr University signed by Professor Maria Hinfelaar, Vice-Chancellor and Chief Executive. Writtle University College signed by Catriona Wood, Director of Business and Finance. York St John University signed by Professor Karen Stanton, Vice-Chancellor. Not sure if your university is already fossil free? Check out People & Planet's Fossil Fuel Scorecards here to find out.